Well we’re into the final week before my next race and as usual I’ve jotted down a few thoughts about both the race itself and how my preparations have gone. The race in question is the Cumbria Way Ultra, a 73 mile foot race, following the trail of the same name, from the centre of Ulverston in the south of the Lake District all the way to Carlisle Castle in the north. This will be my longest race to date, nearly 10 miles further than the Norfolk 100 which I ran back in June. While not necessarily following the most challenging route through the Lake District, there is still over 2000 metres of ascent, with the notable climbs of Stakes Pass out of Great Langdale and the climb over the top of High Pike in the Northern Fells. My preparation has been excellent for once! I was back running a week after the Norfolk 100 and have put in a great twelve week block of structured training leading into this race. My weekly average has been 60-70km, with two easier weeks of 30-40km and three peak weeks of 85km, 85km and 103km respectively. I also managed to get in some nice hillier runs while away in Scotland and The Lakes at the end of August, to put the legs under extra stress and build in some much needed hill fitness. If that sounds a bit complicated, hopefully the graph below illustrates the periodisation quite nicely. The only weak point in my build up has been my focus on my core strength. While I’ve been doing this regularly as part of my weekly training, I haven’t layered this on quite as much as I did in the run up to the Norfolk 100. Hopefully the significantly improved run training this time around will more than offset this – fingers crossed! So I’ve a good block of training in the bag and the taper is now in full swing. I went for a two week taper off the back of my peak week of 103km. Its an approach I have used previously but not necessarily off the back of such a good training block. I’m hoping that the easier weeks during this period will have given me some inbuilt recovery time, so hopefully 2 weeks pre-race will still be sufficient. The stats are showing I’m as fit as I was earlier this year before the Hardmoors 55. This is the one ultra this year that went according to plan and while nearly 20 miles shorter that this weekends race, the elevation profile is very similar. On that basis it seems reasonable to try and replicate as much as I can of both the prep and race plan from this race, to try and ensure I have the best possible day at the Cumbria Way Ultra. As always I’m not sure what to expect time wise. I completed the Hardmoors 55 in 10:46, so on the basis of that and the similar altitude gain across both courses, a finishing time of 15 hours and something should be achievable … should! To focus our minds we’ve booked a hotel in Carlisle which shuts it doors at a yet to be specified time. I’m guessing it will be a case of the quickest man being encouraged off the front once we are past the last checkpoint, to ensure someone gets a key. That or we’ll be risking an uncomfortable night in the grounds of Carlisle Castle! In addition to the distance, this race will also require me to be more self sufficient than in my previous races. While there will be well stocked checkpoints along the course, these will typically be 25 odd kilometres apart, which is further than the 10-16km I’ve experienced before. All part of the challenge which I’m looking forward to it. It will be great preparation for King Offas Dyke next year! Nutrition wise, then I will stick to my usual favourites of Nakd bars and mini malt loaves, with a couple of packs of shot bloks in case I come off the rails at some point. I will make good use of the food on offer at the checkpoints but will be making the effort to really minimise my time at them during this race. My plan is to carry an empty zip lock bag and grab food and go at each checkpoint once my bottles are full. Even if I then walk and eat for a bit at least I’m still making forward progress on the course, rather than dallying in the checkpoints as I normally would. The one thing that has caused me much constination is how much fluid to carry? My preference when racing is to use soft flasks over a bladder as they’re easier to both fill and track how much I’m drinking. However 1 litre is not going to be sufficient for repeated legs of 25km, with 1.5 litres a more realistic amount. I’m therefore left with either switching to my 1.5l bladder or carrying a third 500ml soft flask in my race vest or hand during the longer legs. At present I am leaning towards the flask option, as while annoying for a while, once the flask in my hand has been drained I can pop it into my vest and get back to running as normal. This approach will allow me to continue to keep track of how much I’m drinking, should be quicker to refill at checkpoints and also avoids the annoying sloshing noise that bladders can somethings give you. Finally I need to review my pre-race food choices, to try and avoid the stomach issues I experienced for long portions of the Norfolk 100. This time around I’ve decided to try and get the majority of this nutrition in as liquid, to try and speed up the digestion process and avoid cramps during the run. This will be a bit of an experiment (risky on race day I know!) as I’ll need to balance getting sufficient calories and hydration in against not over filling and getting a stitch in the first 100 yards! So the time has come to put some race objectives out there, hopefully taking the lessons learned during all my previous races and pulling them together to allow me to get the result I hope I’m capable of. 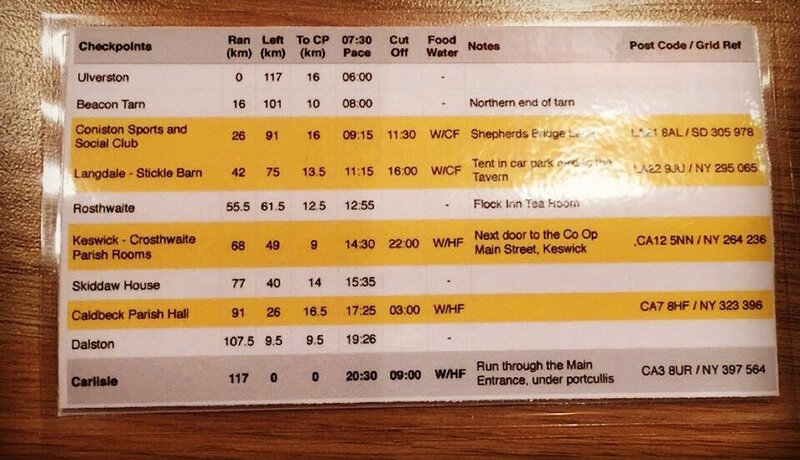 I’ve put together some pacing cards based around an average pace of 7:30/km, which is what I ran at Hardmoors 55 earlier this year and seemed like a good place to start. This has me finishing in 14:30, which I still believe is overly optimistic but does give something to aim for. Average pace isn’t the best approach leg to leg, with the climbs out of Langdale and through the Northern Fells having a significant impact on this. However it should give me something to work against, especially in the later stages of the race. With the final 26km virtually flat it should be pretty clear how well this are going from the Northern Fells onwards. Above all else enjoy it, its supposed to be fun after all! So that’s it. I’m feeling fit, ready to go and have some targets and objectives to work off. The outcome of the race will come down to how I feel on the day, the weather and the terrain that is before me. Above all else I will be looking to have fun, grateful for the opportunity to compete and run through a part of the country I truly love. As always I will be using the Racedrone tracker during the race if you’d like to follow my progress. I’m mixing it up a little this time and rather than the mobile app I am going to give one of their dedicated trackers a try. This should hopefully give better coverage as it works across all the UK mobile networks plus will help preserve my phone battery. Wish me luck and watch this space for my usual war and peace race report at some point next week. Its going to be a blast! Thanks Gaz, glad you enjoyed it. Personally I find there is little else to do during a taper than ponder the finer details, although there is always a risk you take this too far. Looking forward to the race and hopefully get to meet you at some point on Saturday. See you in Ulverston at 6am!